On November 10, 2011, the IUCN* Red List (www.redlist.org) team published the results of this year’s update of the estimated conservation status of species. With this estimate the status of at present altogether 61 900 species has been reviewed using objective criteria. 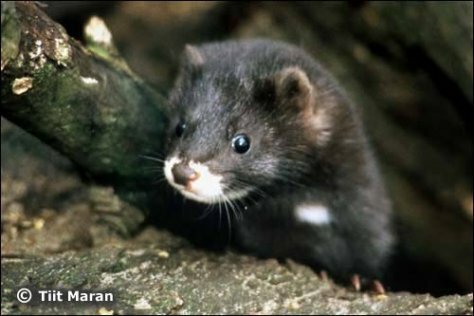 In the present assessment the European mink was raised to the critically endangered category. Belonging there means that the species is considered to be critically near extinction. Among all the predators in the world eight other species are judged to be in the same critical state of danger of extinction. Among all mammals in Europe there are four species besides the European mink in this category, including two predator species: the Iberian mink and the Mediterranean monk seal. Of species occurring in the Estonian fauna at present only the eel is included in the same category. The move of the European mink to a critically endangered species does not in itself mean that its state has worsened drastically from the previous estimate, in 1996, of the global state of the species. The opinion was voiced already then that the European mink might belong to the critically endangered species but lacking sufficient evidence from Russia this could not be ascertained and the European mink stayed in the lower, endangered species category. In this year’s estimate the evidence lacking earlier is included and this made it possible to ascertain the real state of the species. The actions in Estonia to maintain the European mink have had a notable part in the preservation of this species. Almost half of the global population in captivity of the European mink is kept in the Tallinn Zoo and the creation of a European mink population on Hiiumaa is one of the most successful actions in the protection of this species. Today similar species protection actions have been initiated in Spain, Germany and France.